...I just wanted to thank you for the software and the system you made. I won $795.00. Like this FREE lottery system? We also have FREE and EASY To USE stock market and mutual fund systems. Click to visit our FREE Penny Stock trading page. Then visit our FREE Mutual Fund trading page. Both systems are clear and easy to use for beginners. Get Deeper insight into the Delta Lotto system and software. FREE TRIAL of our Analysis Lotto software included. Includes our Delta Lotto DVD Video, a fully upgradable Analysis Lotto free trial on disc, and storage case. Works on any lotto, keno, lottery game, anywhere on earth. Click HERE for a tour of Analysis Lotto's features! 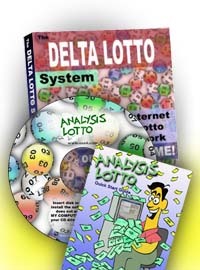 Get Analysis Lotto, our award-winning delta system lottery software, via download. Works on any lotto, keno, lottery game, anywhere in the world. Can you beat the Massachusetts Lotto? CLICK HERE! The Delta Lotto system is a powerful FREE lottery system that improves the odds of playing your favorite lottery, lotto and Keno games by dramatically reducing the number of digits you have to pick from. For example, to play the Massachusetts MegaBucks Lotto game, you need to pick 6 numbers from 1 to 49. QUESTION: what if you could pick your Massachusetts Mega Bucks Lotto ticket from just 15 numbers instead of 49? You think there might be a better chance of hitting a winning pick? This is exactly what the Delta Lotto System lets you do! A Delta lotto number is just a lottery pick reduced to the differences between adjacent numbers. The video below explains the basics of making a Delta lotto pick. The actual number of delta digits to be picked varies from game to game. A fuller explanation of Delta Lotto numbers is on our main page, here. Delta representations of lotto or keno numbers have some really unique mathematical characteristics, and make some very powerful lottery analysis techniques possible. That's where our Analysis Lotto software comes in. Below is a specific analysis of the Massachusetts lottery games, the maximum Delta numbers to use for calculations, and websites where past lottery data can be found for use with the Analysis Lottery software. A more complete explanation is on our main page, here. Or the Analysis Lotto software is available here. A FREE version of our Delta Lottery Calculator you can try with the Massachusetts lottery games can be found here. Setup: 5 from 1-40, plus bonus ball 1-21, DON'T repeat. High Delta: 15 (Most Deltas will be lower than this number) What's a Delta? Click HERE. Click "Find Past Winning Numbers" at the bottom of the page, then select game and date range. Select all the numbers on your browser's screen and copy. Start Analysis Lotto, and make sure the right game is loaded. Choose IMPORT LOTTO NUMBERS from the menu. Click PASTE on the Analysis Lotto IMPORT panel. Check settings below and press GO. If the numbers are successfully recognized, press ADD or REPLACE to add the numbers to your database. Setup: 5 from 1-35, DON'T repeat. High Delta: 14 (Most Deltas will be lower than this number) What's a Delta? Click HERE. Setup: 6 from 1-49, DON'T repeat. High Delta: Not Applicable to this lottery type game. What's a Delta? Click HERE. If you don't see your game here, try the MULTI-STATE game page. Past drawing information for all games is also available from several ALL LOTTO DATA sites. NEW! Software lets your computer pick numbers for ANY lotto or keno game using the Delta system. Available now! CLICK HERE! Copyright ©2000 - 2012 Dave Muse | XHTML | CSS .